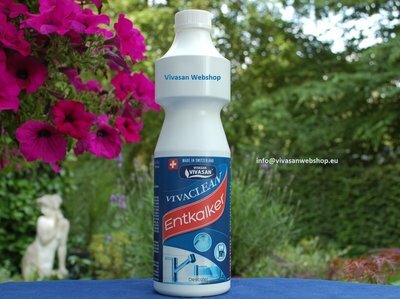 VivaClean Descaler Vivasan pH 0.5 750ml - 25 US fl. Oz. - Vivasan Webshop English - World wide delivery Vivasan Official Webshop® is specialized in shipments to the UK, Ireland and Scandinavian countries. Best prices! Electrical equipment such as espresso and coffee machines, air humidifiers, irons, etc. : Depending on the amount of limescale use VivaClean descaler undiluted or diluted 1:1 (1 VivaClean descaler to 1 part water). Rinse thoroughly with water. Always follow the instructions of the device manufacturer for descaling. Pour in ½ litre of VivaClean descaler and run the main wash programme. Pans, vases, shower heads etc. Depending on the amount of limescale use VivaClean descaler undiluted or diluted 1:1 (1 VivaClean descaler to 1 part water). Leave for a maximum of 2 hours to take effect. Chromium, steel surfaces, tiles, fittings etc. Pour VivaClean descaler directly onto a sponge or cloth and clean off surfaces. Rinse thoroughly with water. Do not use on enamel (e.g. bathtubs) and marble. Take care when removing limescale from acid-sensitive, enamelled bathtubs. VivaClean descaler should only be used selectively on the limescale stripes and should be rinsed off immediately. Descale devices (e.g. coffee machines, irons, dishwashers) according to the manufacturer’s instructions. The manufacturer assumes no liability for damage caused by incorrect use. Rinse thoroughly ample water if the descaler comes into contact with the skin or eyes. Shelf life: at least 2 years. Storage: store only in original containers. pH value0.5. Ingredients: Inorganic acids, corrosion inhibitor, (less than 5% non-ionic tensides).